I could photograph aprons flapping in the wind all day long. And that’s exactly what I did yesterday to make a photographic record of the 82 aprons that will be featured in the first-ever CraftSanity Apron Show to benefit Safe Haven Ministries, a domestic abuse agency that assists women and children here in West Michigan. 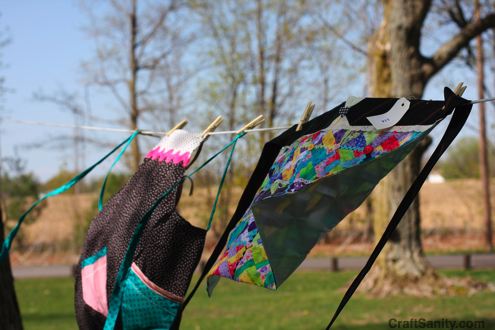 While my children played nearby, I pinned aprons to the clothesline my husband helped me tie between two trees. And I spent the afternoon snapping loads of photos. The weather was perfect and seeing all the aprons that kind people stitched and donated to the cause was absolutely wonderful. I was there about a half hour when the park supervisor road a piece of construction equipment over to my apron staging ground and asked me what I was doing. “Uh, well,…” I said, trying to figure out where to move the photoshoot if he asked me to pack up. Thankfully, he seemed intrigued by the project and we had a nice chat. Soon he road off and left me to the business of hanging aprons on the line. There is still much prep to do before the show opens next week, but it’s fun work that I’m so happy to have on my plate. If you’re local, you’re invited to come to the opening reception and silent auction Friday, April 30 at 6:30 p.m. at the David D. Hunting YMCA, in Grand Rapids. Please RSVP for the show by e-mailing me. (So I can make sure that we bake enough pies.) The show and bidding on a selection of aprons will continue through 5 p.m. May 6. Check back for updates and a complete photo gallery of aprons after the show opens. My heartfelt thanks to all those who spent time making aprons for the cause. I really appreciate it. I am really inspired together with your writing skills and also with the structure to your weblog. Is that this a paid subject matter or did you customize it yourself? Either way stay up the nice high quality writing, it’s uncommon to see a nice weblog like this one nowadays..